M. Wolf and L. Carnera discovered asteroid #488 Kreusa. The first US commercial airplane sale was made by Glenn Curtiss, selling one of his airplanes to the Aeronautic Society of New York for $7,500. Comet 7P/Pons-Winnecke approached within 0.0394 AUs (3.66 million miles) of Earth. 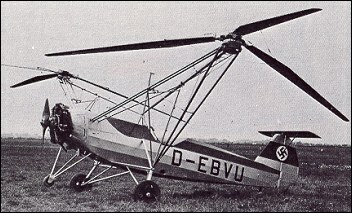 The Focke-Wulf Fw 61, the first practical helicopter, made its initial flight. L. Boyer discovered asteroid #2021 Poincare. Walter Baade discovered asteroid #1566 Icarus inside the orbit of Mercury. The US Air Force X-17 development test program ended at Cape Canaveral. A total of 26 "production" flights through July 1957 studied reentry problems by simulating reentry velocities and conditions with the three-stage solid-fuel Lockheed X-17. The US Navy launched Vanguard SLV 2 from Cape Canaveral, Florida, which failed to reach orbit due to a second stage premature engine cutoff. The first full-scale firing of the Apollo Service Module (SM) engine took place. The first full-scale firing of the Apollo SM engine was conducted 26 June 1963 at the Arnold Engineering Development Center. At the start of the shutdown sequence, the engine thrust chamber valve remained open because of an electrical wiring error in the test facility. As a result, the engine ran at a reduced chamber pressure until the propellant in the fuel line was exhausted, and the engine's nozzle extension collapsed because of the excessive pressure differential across the nozzle skin. USSR launched Molniya 1-14 from Plesetsk for operation of a system of long range telephone and telegraph radiocommunications, and transmission of USSR Central Television programs to the stations of the Orbita network. USSR launched N1 6L from Baikonur, which was destroyed in flight after a first stage control failure. N1 serial 6L, launched 26 June 1971, was a substantially improved vehicle, incorporating filters in the propellant lines to prevent any foreign objects from getting into the pumps. The shape of the booster's tail was modified, and ventilation and refrigeration systems were added to keep the engine compartment cool. It was painted white overall to reduce temperatures while sitting on the pad. During ascent after liftoff, an unplanned axial rotation was introduced by the gas dynamics interaction of the thirty engines with the air in the slipstream. The launch vehicle developed a roll beyond the capability of the control system to compensate, and began to break up as it went through Max Q at T+48 seconds. The engines functioned well and did not shut down until the computer command was unblocked at T+50 seconds. No functional payload was carried, and the launch did not have a working launch escape system. USSR launched Cosmos 496 to verify safety modifications to the Soyuz breathing ventilation valve, a Soyuz 7K-T redesign test. The successful flight ended 2 July, the capsule was recovered 9 July. Nine technicians were killed at the USSR Plesetsk LC-133 Voskhod complex during preparation of a Kosmos-3M booster intended to launch a Tselina sigint satellite when oxidizer and propellant were accidentally mixed together during fuelling. A. Gilmore and P. Kilmartin discovered asteroid #3521. NASA's Galileo satellite made observations of Ganymede as it passed during the probe's ninth orbit of Jupiter. Russia launched Progress M-46 from Baikonur, which docked with the International Space Station on 29 June after carrying out tests of the Kurs rendezvous system on June 28. The Orbview 3 one-meter-resolution commercial imaging satellite was launched from Vandenburg, California on a Pegasus XL booster. The ISEE3 Reboot Project achieved synchronous communication with NASA's ISEE3/ICE probe and obtained the four ranging points needed to refine the spacecraft's orbital parameters.